The Montessori approach to education was developed by Maria Montessori, an educator and physician in Italy. Estimated to be practiced in upwards of 20,000 schools around the world, this approach emphasizes freedom with reasonable limits, independence, and a Constructivist model that allows kids to learn basic concepts through a hands-on approach, rather than through lectures and direct instruction. These 10 iPhone apps can help you teach your child the educational basics in accordance with the methods prescribed by the Montessori approach, supporting his education with the assistance of your mobile device. Montessori Crosswords – Spelling With Phonics-Enabled Alphabet – Kids learn that words are made from sounds with this $2.99 app. Once they learn this, they then learn how to make those words themselves by memorizing the phonic sounds associated with each letter. Eventually, even preschoolers are able to play a simplified version of this crossword game, thanks to the lessons they’ve learned. 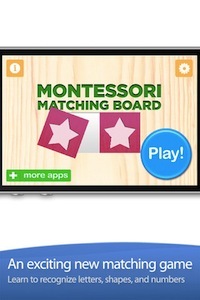 Montessori Matching Board – Learning about shapes, letters and numbers is fun and easy with this $0.99 app, which helps kids learn with a small-scale matching game. The simple interface and clear graphics are easy enough for even an older infant to manipulate, while toddlers and young preschoolers will be able to confidently navigate the app, matching and learning in no time. Alpha Writer – Learning to read, write and spell phonetically are the building blocks of literacy, and are the fundamental skills taught by this $2.99 app. Identifying consonants and vowels, creating and spelling their own words, and focusing on early reading skills are all among the tasks that your child can master by using Montessorium’s Alpha Writer. Montessori Geometry – Give your little one a jump start on Geometry with this $4.49 app, which helps him learn to identify shapes in both 2D and 3D. Activities are self-correcting, emphasizing autonomy and self-confidence, and allow kids to learn independently and be motivated by the earning of reward medals. Montessori Numberland HD – Featured in Apple’s New & Noteworthy and rated five stars out of five by Common Sense Media, the $4.99 Montessori Numberland app is a highly-rated and powerful one, teaching kids to write and recognize the shape of a number, hear its name, and then count objects to reinforce those concepts. You can even help kids learn to count in more than one language by changing the in-app preferences! Montessori Alphabet Maze Free – Improving fine motor skills, learning visual tracking, and extending a child’s attention span are all among the claims made by this free app, which also helps a child master the alphabet through exposure and repetition. The app also contains no ads, does not work with social networking sites, and does not enable in-app purchases, making it a safe one for kids to use with minimal adult direction. Montessori Counting Board – Kids learn to count in ascending and descending order with this app, which offers a variety of formats and counting options. Marketed to kids from infancy to six years old, the $0.99 Montessori Counting Board is highly rated and reviewed by App Store users. Intro to Math – Kids learn the fundamentals of math, how to read, recognize and understand the numbers between 0 and 9, symbols and units, sequence, spatial relationships and problem solving skills with this $4.99 app. Rods, numbers, tracing and counters are among the virtual tools used by Intro to Math, based on proven Montessori methods. Intro to Letters – Learning to read and write begins with understanding and recognizing the letters of the alphabet, a skill that this $4.99 app helps to teach. Learning to draw, read and pronounce letters phonetically gives your child the competitive edge she’ll need to excel academically from an early age, inspiring a love of reading and writing. While your iPhone will allow your child to learn through exploration independently, the Montessori approach is dependent upon parental involvement as well as independent learning. These apps are great ways to keep your child entertained in an educationally-worthwhile way during long delays or car rides, but they work best when you’re there to direct and offer your assistance as needed. For the best results, set aside some time each day to work with your child as he uses these apps. Under the Fair Labor Standards Act, even a salaried nanny’s wages must translate to at least minimum wage, which makes tracking the hours a nanny has worked imperative. Private, in-home childcare providers that are paid an hourly wage have an even greater need to track their billable hours, in order to ensure that they are paid fairly for the time that they work each week. In today’s modern age, nannies and their employers are no longer forced to rely upon handwritten time sheets to calculate the number of hours worked each week; the incredibly popular Apple iPhone has several apps available in the App Store to keep such information at the tip of a nanny’s fingers. Easy TimeSheet – Easy TimeSheet is available in the App Store for $2.99, and allows users to track the hours of every work day, even while the application is closed. As an added bonus, users can email projects and time entries to any email address in .CSV format, making sharing billable hours information with your employer a breeze. iTimeSheet – Sold in the App Store for $5.99, iTimeSheet is a pricier option for tracking hours worked, allowing users to access archived information with a touch of the screen. There are several features that may be superfluous for nannies, however. WorkTimer – WorkTimer is a $0.99 app that allows a nanny to track the hours she’s worked as the application runs in the background, and also to adjust data in the event that she forgets to clock in or out. There’s also a back-up option that stores data in the cloud via Dropbox. Timely – In addition to tracking billable hours, this $0.99 app will allow nannies to see their wages adding up in real-time; this motivational feature can certainly come in handy on high-pressure, stressful days. You can also track overtime earnings and access archived data for reference. HoursTracker – Deemed the “Best Time Tracking App For iPhone” by Lifehacker, the $3.99 HoursTracker app is an intuitive, easy-to-use offering that continues to track hours even when your phone is powered down. With overtime and double-overtime support, HoursTracker is a great choice for tech-savvy nannies. Bill4Time Mobile – Bill4Time is a free app that acts as an add-on to the Bill4Time.com website; users of the web application can track hours through their iPhones with minimal effort. The web service does charge an operating fee, however. PunchClock – Available for $0.99 in the App Store, PunchClock makes tracking hours and sending .XML format reports to your employer the work of a moment. Very simple, with no bells and whistles, PunchClock does just what it’s intended to. TimeWerks – While the full version of TimeWerks is $2.99 in the App Store, there is a free offering called TimeWerks Lite that may suffice for nannies who don’t typically have a need to track hours for multiple clients. The app allows you to print or email data in .HTML or .PDF format, as well as track expenses. TimeCard Pro – Purchasing TimeCard Pro once allows you to use the app on your iPad as well as your iPhone, making it even easier to track the number of hours you’ve worked each day, week, and month. The “QuickContact” option also makes quick work of connecting with your employers via their contact information in your phone. TimeClock ST – TimeClock ST is the most expensive option on the list, and is a hefty $8.99 in the App Store. The app does allow multiple devices to access a single account, so your employers can also track your hours in real time. There are expansions available to increase the app’s functionality even further, but they’re probably unnecessary for nannies. Regardless of what app you use to track your hours, it’s important for your own finances, and those of your employers, that you keep meticulous records each day; even if you’re a salaried employer, being able to access and accurately track your billable hours is essential. It’s also required by law that nanny employers keep accurate payroll records that include the hours that the nanny has worked. These iPhone apps make compliance to that law easy.